Everyone talks about eating dinner together as the savior of the modern American family, but frankly I learn more about my children and their view of the world from playing games with them. 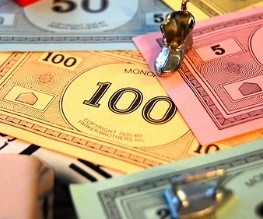 No game of Monopoly will ever be finished in our lifetime. Frank: I’ll make you proud of me, Grandma! I’ll put up a hotel in your name! Some of these “legacy” players burst into tears everytime they pass Go. Monopoly is designed to be most attractive to children exactly ten minutes before bedtime. They don’t want you to know this, but Monopoly sets are designed by the Hasbro Company to send off powerful board game pheromones that trigger a child’s intensive whining mechanism. Fact. If you are playing against a child, you will never get to be the race car. You will be relegated to the piece that always falls over on its side. In fact, no one gets to be the race car unless your dog, who swallowed the piece while you were trying to remember how much money everyone is supposed to start with, decides to play along by upchucking it onto the board. Children do not voluntarily clean up dog vomit. When playing Monopoly against a parent or sibling, it is not enough to win. You must destroy your opponent, seize his and/or her properties without mercy, bankrupt them financially and crush any remaining will to live. This is not as difficult as it sounds, because in all likelihood you will still be playing around midnight, when everyone is pretty much zapped anyway. 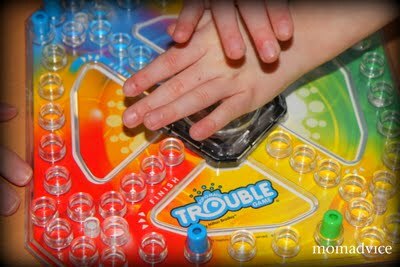 In the game of “Trouble”, you will never roll a six. Ever. But your youngest child will, and they will use that roll to capture your piece, sending you back to the beginning. Even though you helped them push down the ridiculously brittle die bubble, cooked them dinner, and more importantly, suffered through 14 hours of back labor for them. Even though you are the one who TAUGHT them how to count to six. Holding down the die bubble longer does not, I repeat NOT, give you more of a chance to roll the number you need. Nothing good comes from pounding it with your fist, either. While you were explaining this to your child, the dog has been eating your pieces. At some point during the game, your kids will begin to humor you. They might offer to help move your piece for you, or perhaps help you push down that ridiculously brittle die bubble. Do not fall for this; it’s their way of cheating, bless their larcenous little hearts. When you are not looking, they will push the die bubble a second time, or move your piece to where it’s most vulnerable. Or they will feed it to the dog. Great new blog site (but I miss the parrot logo). Showed Mom the photo of your new book in the store window in Westfield. Must have been a real thrill for you to pass by and see it displayed so prominently. Keep up the good work, kiss the kids for us. PS – Try to keep Jade away from those game pieces. Nobody really likes to clean up doggie vomit. Of course, there is Scrabble (or any of its variants), wherein a nine-year-old will insist with a great deal of moral certainty that GARGAL is an English word. Or that POLOI was the disease that Salk and Sabin developed vaccines for.